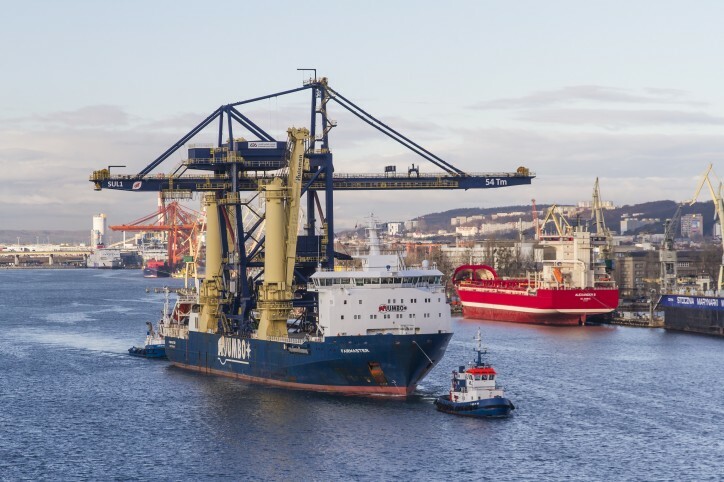 Jumbo recently completed two shipments of two giant ship unloaders from Gdynia Port, Poland to Djen Djen Port in Algeria for Fagioli. The ship unloaders are intended for unloading bulk cargo from vessels on the quayside. The first lift and shipment was made last December 2018. The MV Fairmaster and her crew lifted the 1400t, 60 metres high ship unloader. The team then sailed through Egersund and Rotterdam before arriving in Algeria for discharging in Djen Djen. In the video footage here you can see the first discharge operation of the 60 metre high, 1400t unloader in full swing! The second shipment was made in February 2019. View here the spectacular footage of the Fairmaster leaving Gdynia Port for a second time, having lifted the second giant ship unloader. The two shiploaders can now be seen on the quayside in Djen Djen port. Thanks to all the teams involved for the successful completion of both lifts and transportation.